President Tran Dai Quang and his Italian counterpart Sergio Mattarella have displayed their resolve to deepen the Vietnam-Italy strategic partnership in an effective fashion during their talks in Rome on November 22. Accordingly, the two sides will increase the exchange of all-level delegations and meetings, materialise the action plan on implementing the bilateral strategic partnership for 2017-2018, and maintain exchanges between the two countries’ Parties and citizens. They agreed to prioritise economic cooperation and raise bilateral trade to 6 billion USD during the 2017-2018 period. Both will work to increase Italy's investment in Vietnam while creating optimal conditions for Vietnamese agricultural and aquatic products to access the Italian market. The two leaders consented to put forth new orientations for development cooperation in accordance with the bilateral strategic partnership, focusing on vocational training, environmental protection, water resources management and flood forecast. Collaboration in culture, education-training and tourism will be enhanced while scientific-technological affiliation will receive priority in the coming time. 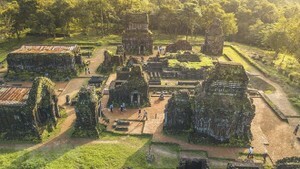 The Italian President pledged to continue assisting Vietnam in relic site preservation and offer more scholarships to Vietnamese students. The Presidents agreed to work with each other to soon open a direct air route between the two countries and share experience in implementing public-private partnership (PPP) projects in logistics, shipbuilding, railways and infrastructure. In the sphere of national defence and security, they will increase the exchange of information and experience in crime combat, and beef up affiliation in training, relief operations, bomb and mine clearance, defence industry, and joining UN peace-keeping missions. In the same vein, Vietnam and Italy will strengthen their coordination at multilateral forums like the UN, ASEAN, EU, the Asia-Europe Meeting (ASEM) and UNESCO. Host and guest promised to support each other in a bid to promote the relations between Italy and Asia-Pacific as well as between Vietnam and the EU, with heed paid to projects, programmes and initiatives on climate change response in combination with green growth. The leaders highlighted the significance of maintaining peace, stability, and navigation and aviation safety and freedom. They held that disputes in the East Sea should be addressed by peaceful measures on the basis of respecting international law, the 1982 UN Convention on the Law of the Sea, fully realising the Declaration on the Conduct of Parties in the East Sea and soon reaching a Code of Conduct in the East Sea. President Quang stated that Vietnam always attaches importance to the friendship and multi-dimensional cooperation with Italy. For his part, President Sergio Mattarella described President’s Quang visit as a milestone of the bilateral strategic partnership which was set up in 2013. Following their talks, the two leaders co-chaired a press conference to announce outcomes of their talks. On November 21 (Italian time), President Quang visited the Vietnamese Embassy in Italy. His State-level visit to Italy lasts from November 21-24. 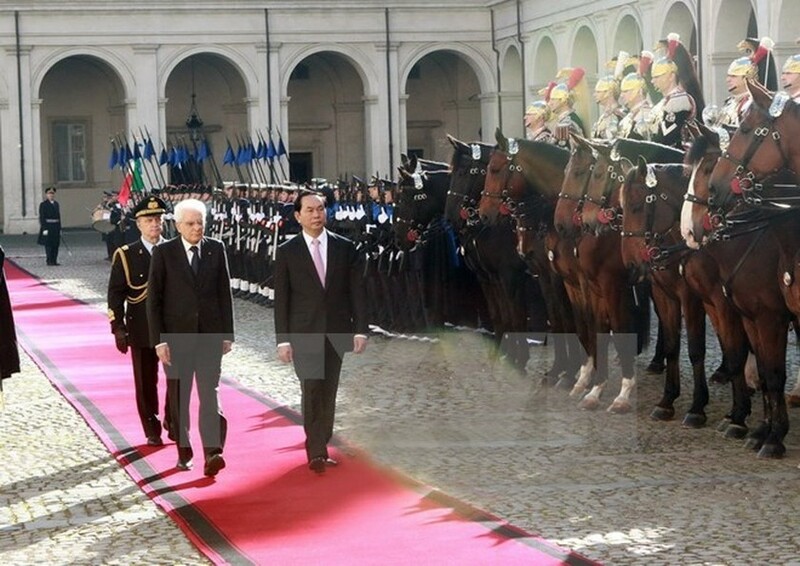 Vietnam and Italy established diplomatic ties on March 23, 1973. Italy was the first Western European nation to back the enhancement of cooperation between Vietnam and the EU at major international forums, as well as the normalisation of relations between Vietnam and international financial, trade and monetary organisations in the 1990s. Trade between the two countries has increased years by years, reaching 4.3 billion USD in 2015. Italy ranks 31 out of 112 countries and territories investing in Vietnam with 77 projects valued at 360 million USD, mostly in processing, manufacturing, leather and footwear, construction, lavatory equipment and steel processing. The Italian Government has listed Vietnam as one of ten newly-emerging markets to prioritise trade and investment ties with. The two countries also set up a joint committee on economic cooperation. Italy began providing official development assistance for Vietnam in the 1990s in areas like water supply and sewage, environmental protection, human resources development, health care and institution building.